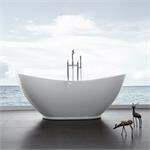 The Cordova freestanding oval soaking tub has beautiful curves with minimalist lines. The Cordova provides a truly relaxing deep soak and the modern design will add flare to any contemporary bathroom.The Linear drain overflow comes in chrome finish. 69"X 37"W x 29"D. Call 800-720-1062 for more details. 32" x 69" x 27"